The early 1800s saw the property being used by a blacksmith and then an ironmonger. From about 1875 onwards until the late 1950s, it was the town’s Post Office, although strictly speaking it was only a sub post office. Since the 1950s it has been a drapery, a haberdashery and more recently a Thai Restaurant as shown in the photo above. This extensive property extending down the alleyway to several buildings in the rear has seen a number of different uses over the years. We haven’t seen the deeds of the property but fortunately some of the owners and occupiers are mentioned in other documents. We have a copy of a damaged indenture referring to the property next door (26 High Street) dated 23rd September 1730. This describes the properties on both sides of that property, but frustratingly the key words ‘north’ and ‘south’ are missing! We are guessing that 28 High Street was the one described as ‘a messuage or tenement late of one Robert Thurston the Elder late of Thornbury mercer deceased and now of John Thurston his grandson and wherein one Robert Whitfield now dwelleth on the …ward side thereof’ because we know that the Thurstons owned several other properties adjoining to this property. Robert Whitfield was buried on 1st April 1741. Read about the Thurstons. An abstract of title written in 1887 for the property next door (26 High Street) provides a useful source of information about the people associated with this property from the mid 1700’s. This property was referred to as ”the lands and tenements formerly of one William Swanley afterwards of Thomas Swanley and late of John Swanley his brother since of Elizabeth Lippiatt widow and formerly in the occupation of Thomas Ford, horse breaker but afterwards belonging to and in the occupation of Frederic Parfitt and since in the occupation of Henry Robbins as tenant thereof on or near the southward part‘. THE SWANLEYS – we don’t know a great deal about the Swanleys mentioned in the abstract of title. We note that one William Swanley died on 4th April 1706 and another died on 18th May 1755 aged 75, but we don’t know which one, if any, is the William first mentioned in the abstract as the owner of this property. The Overseers Accounts show that younger William Swanley was living at 5 High Street from 1739 to 1746. The poor assessment lists show that John Swanley owned the property in 1769 and 1770 when it was tenanted by William Davis. John’s will dated 30th September 1766 shows he was a cordwainer in Thornbury and he bequeathed his property to his niece, Hester Osborne and made her his sole executrix. The will was proved on 26th June 1769. In the Court Rolls of 1760 there is a record of ‘John Swanley being duly chosen to serve the office of Searcher and Sealor of Leather for the year Ensueing and having had legal notice given him to appear at this Court to take on him and be Sworn in the said office did not appear therefore they amerce him in the sum of Forty shillings for such default‘. Based upon the fact we know John took over the property after Thomas Swanley, we assume that it was the Thomas Swanley who died in October 1760 and he was likely to have been John’s brother. Thomas is also mentioned in the Court Rolls of 1760. He was in trouble, among others, for ‘heaping up dung and muck in the streets’ and he was fined two shillings and sixpence if he didn’t move the nuisance within one week. The 1775 land tax record shows William Davis was the occupying the property. The notes alongside this entry say that it was ‘for Osborns’. We don’t if this was referring to a previous owner of the property or the current owner, but it presumably has some connection to the Hester Osborne who was left the property in John Swanley’s will. John Lippiatt (1721 – 1777) – John was born about 1721, the son of Thomas Lippiatt, a tailor and his wife, Mary. John and his wife, Ann, had at least four children: William born on 21st June 1744, John baptised on 17th August 1750, Ann baptised on 19th April 1747, Thomas baptised on 30th October 1751 and Hannah. On 15th October 1777 when he wrote his will John Lippiatt described himself as a “taylor and innholder of Thornbury”. He left to his wife Ann for her lifetime “All that my messuage or Tenement situate and being in the Borough of Thornbury aforesaid called Pye Corner with the Backside, Buildings, Garden, Orchard and all other the Appurtenances thereunto belonging now in the tenure of William Davis”. It is possible that Pye Corner was the name of his inn. It is noteworthy that his son John who was also “an innholder of Thornbury” continued to call the property Pye Corner when he mentioned it in his will of 1786. 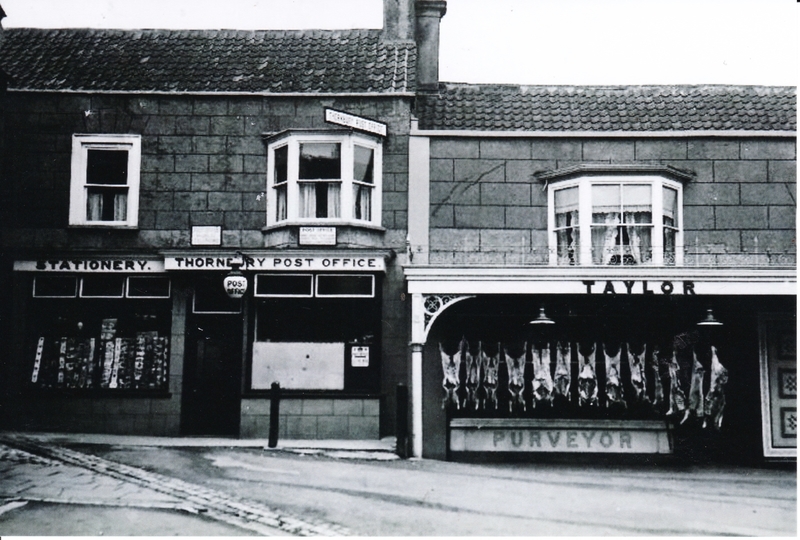 However as yet we have found no confirmation that a public house known as Pye Corner existed in Thornbury. Meg Wise of Thornbury Museum has done some research into this mention of “Pye Corner” and the fact that this area was known by that name up until comparatively modern times. She believes that this may have been the site of “Pie Powder Court.” She found that the 1670 Grant of Market Rights of Thornbury from King Charles II to William Viscount Stafford and his wife Lady Mary, was for a “market for the buying and selling of all manner of corn and cattle as well as any other thing or merchandise” weekly on a Wednesday. It was also a grant for “two new fairs” one on the Monday every Easter week and one on the nearest Monday to the Feast of the Apostle (December 21st). The Staffords were “to have hold and enjoy the said market, two new fairs….. and Courts of Pie Powder”. The term “Piepowder” comes from a French term meaning “dusty feet” pied poudre and applied to an exceptional judicial process for trying civil cases involving travellers (usually merchants or their customers) from outside the locality. These courts were usually held on market or fair days in towns and boroughs. Meg believes that “Pye Corner” could have been the venue for such a court and this is supported by the fact that it was in the most suitable place being adjacent to the street market site. It was also near to the Market House, with its single cell gaol (known as the Blind House), where offenders could have been imprisoned. The courts were generally held in public houses and it may be significant that John Lippiatt was known to have been a publican. It is possible that John Lippiatt was not a publican on this site however as it is known that in 1755 John Lippiatt was the licensee at The Crown which was an inn on the opposite side of the street (a property that later became known as 25 High Street). The Mayors Accounts show that John was renting the property from the Kings. The 1770 Assessment of the Poor Rate which shows ‘John Lippiatt for part of Kings’. John continued at the Crown until his death and then Ann took over. After Ann’s death the property called ‘Pye Corner’ was to be left to their son, William and his heirs and in default of this to their other son, John. He also left £20 to William, £30 to John, £20 to daughter, Ann, by then the wife of Benjamin Bernard (or Barnett) glover and £30 to daughter Hannah then unmarried. John died aged 56 and was buried on 15th September 1777. Ann died aged 70 and was buried on 23rd October 1785. By the time of her death, Ann had moved to live in Sibland and she left her property there to her daughter, Ann Barnett for her lifetime and then to her grand-daughter, Anne. She also left £30 to her daughter Ann and £50 to daughter Hannah and the rest of her personal estate she left to her only surviving son, John. John Lippiatt (1750 – 1789) – following the death of his mother in 1785 John inherited the property at Pye Corner in accordance with his father’s will dated 1777. On 4th December 1785 John married his late brother’s widow, Elizabeth. Elizabeth Taylor had been baptised on 27th March 1741 and on 13th March 1766 she married William Lippiatt. William died on 1st September 1780 aged 37. We believe John took over the Crown following his mother’s death in 1785. The Mayors Accounts show that John’s widow, was paying the rent charge on the property from 1789 to 1799. In John’s will dated 14th April 1786 he described himself as an innholder of Thornbury. He left his property at ‘Pye Corner’ now in the tenure of Thomas Ford to his wife, Elizabeth Lippiatt during her lifetime and then to his lawful issue if any, otherwise to his nephew, John Taylor, who was the son of his sister, Hannah. Hannah had married James Taylor on 13th June 1779. John Lippiatt died on 3rd February 1789 aged 39. Elizabeth (or Betty) carried on owning the property, now let to Thomas Ford. In her will dated 27th December 1799 Elizabeth made bequests to her three nieces – Elizabeth, wife of John Bruton, Sarah Eley and Hannah Eley, daughters of her sister Ann Eley – 19 guineas each. To her two nieces Hannah and Mary, daughters of her late sister Sarah Tompkins she left £10 each. To her three nieces Hannah Greenwood, Sarah Greenwood and Mary, wife of John Shepherd, daughters of her sister Mary Greenwood, widow, she left 19 guineas each. To her two nieces – Hester, wife of Edmond Monday, and Mary Taylor, daughters of her sister Hester Taylor, widow she left 19 guineas each. Other bequests included 19 guineas to Mary, wife of Thomas Woolwright the younger, £5 to Ann Barnett, widow, and then £5 each to her nephews, James Eley the younger, staymaker, and John Greenwood, cordwainer, both of Thornbury. This was for their trouble as executors and trustees. Elizabeth left the residue of her goods, chattels and personal estate in trust to ‘Ann Lippiatt Thomas, the illegitimate daughter of Mary Thomas, a single woman when Ann was born but who later married James Williams of Olveston. When Ann was baptised on 7th April 1785 she was given the name of Ann Lippiatt so it is assumed that Ann’s father must have been related to Elizabeth, possibly one of her sons. The will said that if Elizabeth died before Ann was 21, the trustees were instructed to use the estate to provide for Ann’s education and give the rest to her when she was 21. Elizabeth died in 1800. In 1804 Ann Lippiatt Thomas married James Bevan in 1804. Thomas Savery – we are fortunate to have found an abstract of title for the property in Gloucester Records Office. This shows that Thomas Savery acquired the property on 25th March 1801. The 1809 Rent Roll shows that Thomas Savery was the owner and occupant of the property. Thomas also owned the property at 30 High Street which he was renting to Sarah Withers, the previous owner of that property. On 29th June 1824 Thomas arranged for a mortgage oh 28 High Street for £750 from David Baxter. An indenture of lease and release dated 7th and 8th October 1831 shows Thomas had failed to repay £500 of the money borrowed. He sold the property to Mark Williams for £500 to enable him to repay the loan. Thomas Savery was born about 1769 based on his reported in the 1841 census. On 20th April 1794 Thomas married Jane Trayhurn in Thornbury. They had at least two children: a son, Thomas, born on 14th May 1795 and another son, James, born on 3rd March 1797. We note that there is a Thomas Savery listed in the 1839 Robsons directory as being a cheese factor, but we don’t know if this is the same person as Thomas was noted as being a carrier when he sold the property in 1831. The 1841 census shows Thomas was then living at what we believe later became known as 12 Rock Street and he was described as a yeoman aged 72. Frederick and Caroline Herapath Parfitt – the 1851 census shows the Parfitts living in the house. Frederick was an ironmonger employing one tinman and a boy. He was aged 45 and had been born in Clutton. Caroline was aged 30 born in St Phillips in Bristol. They were still living there in the 1861 and 1871 censuses. Frederick died on 11th May 1874 aged 69 and was buried on 16th May 1874. The property was left for the use of Frederick’s widow, Caroline and after her death it was left to Sydney Symes. By 1876 Caroline had moved away although she still retained ownership of the property. In February 1881 Caroline advertised the property for sale. It was described as: ‘All that substantially erected and commodious dwelling house and shop containing two front shops (one of which is now used as a Post Office), two show or store rooms adjoining, sitting room, kitchen, cellar, with four bedrooms on the first floor, and all necessary and convenient offices adjoining. Adjoining the above are Tinsmith’s workshops with forge and several buildings used as storehouses and sheds. There is also a large and productive walled garden and a good supply of soft water. These premises are most desirably situated in the High Street of the town of Thornbury, are in the occupation of Mr Henry Robbins, postmaster and ironmonger, and are well adapted for any business requiring good storage room, and are in good and substantial repair and condition. The above property will be sold subject to the life interest therein of a Lady aged 60 years or thereabouts‘. We don’t know exactly what happened to the ownership of 28 High Street. The 1899 Rate Book leaves the owner column blank and by 1905 it was owned by ‘Mrs Pritchard’ and then by 1910 Arthur Charles Pitcher was the owner. The photo below was kindly sent to us by Craig Maishment who lives in Canada. The post office is on the left. Arthur Charles Pitcher – the Prewett’s Almanack 1909 shows that Arthur Charles Pitcher had taken over as sub-postmaster from Henry Robbins and the 1910 Rate Book shows that he had also become the owner of the property. We don’t know who owned the property after the Pitchers and it is possible that the occupants of the property, John Cullimore, Sew ‘n Sew, Copper Kettle and Thai Basil also owned it.